“That seems a bit pricey for just a proofread.” That’s the comment I received after sending out a quote this week. What the client really wanted was not a proofread, but an edit – not many people know the difference; many underestimate the role that each has to play, and the painstaking work involved in each. So here’s a quick primer. Editing a document is not just about checking grammar, spelling and punctuation, although checking those is an important part of the process. It also looks at the writing as a whole and tries to improve it. Does the document make sense? Is its meaning clear? Is it logical? Does it flow? Is there any missing content that might aid the reader in understanding it? Are there racist or sexist statements in it, or utterances that might result in legal action? Has jargon been used appropriately? Is the tone and register appropriate for the purpose? Are the tenses consistent? And that’s just for starters: those are just some of the things a good editor will look at and flag for the writer or client’s attention. 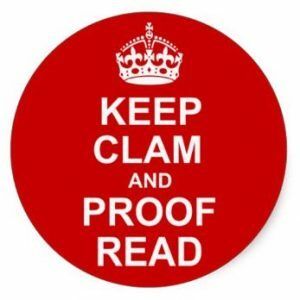 Once those issues have been answered and resolved, only then do you consider proofreading. Proofreading looks at the final, final, final document, and tries to find any errors that have slipped through – missing words, homophones that are incorrectly used (think ‘their’ vs. ‘there), incorrect punctuation, grammar or spelling, correct page numbers on your contents page, consistency of headings and sub-headings, and so on. It’s also painstaking, but it’s important to understand that proofreading is not there to fix serious errors – which is why it often costs less than an edit. Bad writing and serious problems with syntax and structure need to be fixed before the document is ready for proofreading. Both editing and proofreading fall under the ambit of quality control, which is a vital part of any production process. Consider whether or not you would be prepared to drive a car that hadn’t been through a quality control process. And think about this – when you receive an email from a 419 scammer, one of the first things that alerts you to the fact that the email may be dodgy, the contents notwithstanding, is the language use. It’s often awkward and full of errors. So editing and proofreading can help to legitimise your written communication in the eyes of the reader. Quality control in your organisation’s written communication isn’t ‘just’ proofreading – it tells those reading it something about your business ethos, about your attention to detail. Because if you can’t even be bothered to ensure your communication is well-produced, why should your customers or clients believe you’ll take care of the details anywhere else? Great post. I am 80% proofreader, 20% editor. Not great, I know. Question: para 2, line 1 – comma after “wanted”? Is this correct? No, it’s not – which just goes to show that we all need an editor. Thanks! Have amended.